World-champion reining trainer Casey Deary explains how to teach your horse to lope off on the correct lead. Teaching your horse to lope off on the correct lead can be achieved in three simple steps: the set-up, the cue and the release. 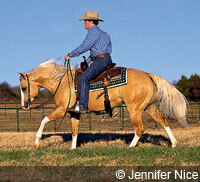 World-champion reining trainer Casey Deary, of Deary Performance Horses in Weatherford, Texas, explains how. The key to getting the correct lead every time is to set the horse up properly for the lope departure before asking for a particular lead. The horse’s outside hind leg is his driving leg. Therefore, if that leg is underneath the horse when he is cued to lope, there is a better chance that he will lope off correctly. “If I am going to lope off to the left, I want the horse’s right rear leg to be forward and underneath him, or on the way forward and underneath him, before I ask him to lope,” Deary says. 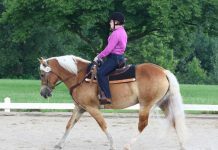 When loping off from a standstill, Deary will allow his horse to take two or three steps to make sure the horse is in a good frame to lope off correctly. “However, by the time I’m ready to show, my horses will lope off from a standstill,” he says. The horse learns that, when Deary pushes with his outside leg, he is to move his hip away from Deary’s leg but wait for the verbal cue to lope off. “The cue to lope is me clucking,” he says. Don’t lean in to influence your horse to pick up a particular lead. “On a younger horse, I may lean forward a little bit, but on a broke horse I expect the horse to do all the work,” Deary says. “When I put my leg on the horse and cluck, I expect him to pick up the correct lead without me having to push or lean. Love it! I’m an Improver rider and when I asked my (ex) trainer how to help the horse when asking for lope, she said “Just ask. She’ll work it out.” I knew it had to be something to do with hind feet placement but couldn’t quite ‘get it’ on my own. Thank you very much for this article – it is now ingrained in my head – and, oh, yes, I’m going it alone! another thing is that when you’re counter cantering, it should feel the same as the correct lead, because your horse should be wiling, and well rounded/driven up. trust me, it’s hard to master. haha. my horse, Dayzi can do it pretty well now and she feels almost the same both ways. it took FOREVER to get her that way! Good to know though I’m not sure why pulling the head to the outside would help.